You can’t separate Lenin the revolutionary leader from the Lenin who made a significant contribution to the development of Marxist theory. This is the problem with an important new book by Slavoj Zizek, Revolution at the Gates. A hundred years ago, in his pamphlet What is to Be Done?, Vladimir Lenin wrote in some detail about the need to bring theoretical clarity, organisational shape and discipline to the revolutionary Russian Social Democratic Labour Party (RSDLP). The background to his 1902 pamphlet was the emergence in Russia of the international trend that wanted the movement to change from a party of social revolution into a democratic party of social reforms. In Russia, this took the form of those who, as Lenin put it, wanted to reduce “the working-class movement and the class struggle to narrow trade unionism and to a ‘realistic’ struggle for petty, gradual reforms”. The group in Russia known as the Economists claimed that Lenin’s supporters overrated the importance of ideology. Instead, the real task was to “lend the economic struggle a political character”, they maintained. “Since there can be no talk of an independent ideology formulated by the working masses themselves in the process of their movement, the only choice is – either bourgeois or socialist ideology. There is no middle course (for mankind has not created a “third” ideology, and, moreover, in a society torn by class antagonisms there can never be a non-class or an above-class ideology). Hence, to belittle the socialist ideology in any way, to turn aside from it in the slightest degree means to strengthen bourgeois ideology. 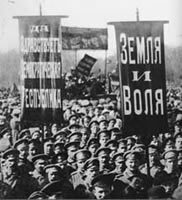 A year later, at an historic Second Congress of the RSDLP held in London, the exiled Russian revolutionaries struggled for four weeks over the guiding principles for a revolutionary party in the wake of what Lenin had written. Huge differences emerged that still resonate a century later and demand re-examination in the context of today’s vastly different world conditions. A significant contribution to this contemporary challenge to look afresh at Lenin is made by Slavoj Zizek in his new book, Revolution at the Gates*. Refreshingly for an academic, Zizek is a revolutionary. His view is that globalised capitalism is creating the conditions for social revolution and that Lenin’s approach in the Russian Revolution of 1917 holds lessons for us today. The book has many strengths but also considerable weaknesses. In his introduction, Zizek enthusiastically examines how the globalisation process has remade old political forms and become a “shattering experience” for the socialist movement equal to that of August 1914 when social democratic parties throughout Europe endorsed war. Zizek, who teaches at Ljublijana University, Slovenia, shows how Lenin turned the political disaster of 1914 to his advantage. Out of the catastrophe “a unique chance for revolution was born”, was how Lenin saw it. Lenin’s “settling of accounts” with those who had betrayed the movement was through the policy of destroying the capitalist state, Zizek says. 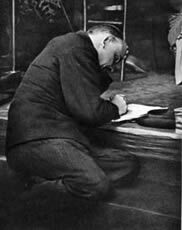 Lenin resisted the pressures for compromise from inside his own party throughout 1917, rejecting those who argued that there was no guarantee of success or that the objective conditions were insufficient. The question is, what is the relationship of Lenin’s struggle to making the conquest of power the central issue to the world of 2002? Zizek’s statements lend powerful support to the notion that as a result of the globalisation process there is no space for reform-minded politics in the 21st century. His assertion that our “1917” is fast approaching is equally forward-looking at a time when large sections of the “left” are bedazzled by the apparent power of global capitalism. The middle section of the book consists of freshly translated writings of Lenin from 1917 as he prepared himself and the Bolshevik Party for the revolution of that year. Zizek’s afterword, unfortunately, is much weaker than his foreword. Alongside some really useful observations about modern capitalism and the inadequacy of the thinking of many of its opponents, there is theoretical confusion and considerable rambling on cultural theory, psychoanalysis, films he has seen and other matters. He is extremely clear when he analyses the prevailing ideology in capitalist society which, he says, amounts to a “prohibition on thinking”. You can say and write what you like – on condition that you do not actually question or disturb the prevailing political condition. He is acute in dealing with the role of the universities in reinforcing the concepts acceptable to the global capitalist market. Zizek is scathing about the emphasis on the importance of “narratives” and is illuminating about the role of “reality” TV in maintaining a grip on mass consciousness. This all rather begs the question: how did Lenin actually lead the Bolsheviks to make a successful seizure of power in Russia in October 1917 if he was as theoretically inept as Zizek claims? Did he just have an eye for the main chance? How did someone whose theoretical approach was apparently “infamous” ever succeed in leading the first successful socialist revolution? We are forced to conclude that improvisation and intuition did the trick. If this is really the case, there is, of course, no need for theoretically-guided practice in the struggle for power against corporate-led globalisation. Zizek is not the first to repudiate the concepts in Lenin’s major philosophical work, Materialism and Empirio-criticism, in which he examines the dialectical relationship between being and thinking. The work exposes a whole variety of idealist forms of thinking, where the subject is made the source of their thoughts. An excellent guide to this book is Evald Ilyenkov’s Leninist Dialectics and the Metaphysics of Positivism. Zizek’s own brand of idealist thinking leads him into all sorts of dangerous territory. Stalinism, for example, is seen as an almost natural extension of Leninism. The break-up of Stalinism is referred to as the “collapse of Communism”. In this way, Zizek embraces the very bourgeois ideological approach and language that he criticises elsewhere. The increasing socialisation of capital, whereby the ownership becomes more and more diffuse leads Zizek to conclude that the “role of property is diminishing” and is no longer a central issue for revolutionaries. The choice for him is between “a hierarchical and an egalitarian post-property society”. This alleged “disappearance” of the role of property is a superficial reading of the contradiction between the form and content of ownership, something that has developed to breaking point. The masses who are exploited by the global corporations in every part of the world know that the form of ownership is increasingly hard to pin down, but their position as wage slaves has not changed because the role of property is the same. In fact, the ability to move capital freely makes their position more vulnerable than ever. The idea of “post-property” is fanciful to those at the receiving end, as anyone trying to reclaim and occupy an empty property will testify. An inherent weakness of capitalism is that pure, private ownership cannot sustain expansion. The expansion of capital in the 21st century assumes investment on such a vast scale that the character of funding takes on an ever broader and more social form. Ever since the joint stock company introduced shareholding in the 19th century, the ownership of capital has become more and more social in its nature. Today, pension funds and other global financial institutions are the major controlling influences. This conflict inside ownership itself demonstrates how the social has emerged in a profound way within a capitalism based on private property. This itself reflects the fact that while production remains entirely profit-driven it takes the form of a highly complex division of labour based on social collaboration and the use of advanced technology across continents. For the role of property to “disappear” as Zizek puts it, for it to become truly social and not the major issue for society, we have to abolish its function under capitalism. Social ownership and control of property are therefore the core of revolutionary political objectives. This fully socialised property then becomes the basis of a not-for-profit society. The intensified contra-dictions within existing property ownership provide us with extremely favourable conditions for doing this. “How do we invent the organisational structure which will confer on this unrest [anti-capitalist movements etc] the form of the universal political demand? Zizek’s is an important and welcome statement. A century has passed since Lenin wrote his pamphlet. It was aimed at contemporary opportunists and those who masqueraded as Marxists while in practice they tail-ended the movement. Today, the same issues are present, although they take a different form. Zizek in the end sees Lenin as some kind of saviour with super-human powers. In representing the case for revolutionary theory and practice we are obliged to make a deeper analysis. What Zizek has started others must finish.